Survivor Journey Folio is uniquely designed to protect your tablet from drops and damage, but with all the coverage and versatility you need from a folio. Impact protection with a versatile, hard-working cover make Survivor Journey Folio the perfect folio case for all the ways you use your tablet. Journey Folio folder cover flips closed to keep your multi-touch display clean and safe from damage. Held in placed with built-in, hidden magnets, the scuff-resistant cover is made from premium vegan leather, and has a no-scratch/no-smudge lining. 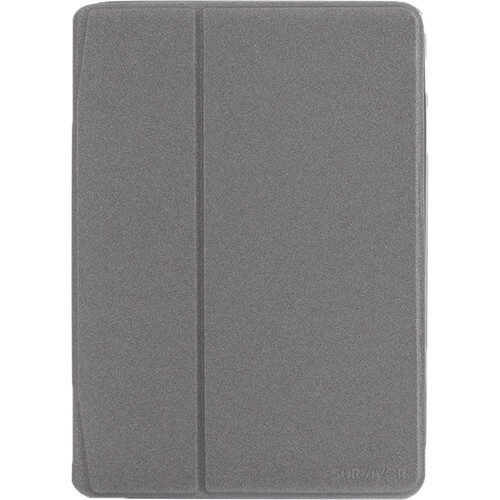 Remove Journey's cover and you're still covered with a flexible shell that protects your tablet from drops. With a no-slip texture gently contoured sides, Journey's shell is for reading and gaming on your tablet. Flip Journey Folio's cover open and position your tablet perfectly to catch up on videos. The cover also positions your device perfectly for typing or surfing.